A damning account of Senator Edward Kennedy’s role in the 1969 car accident that killed his potential presidential campaign secretary, Mary Jo Kopechne (Kate Mara). Political corruption comes to the fore as the last surviving son of the Kennedy clan faces potential charges. Australian actor Jason Clarke (Dawn of the Planet of the Apes, Mudbound) completely owns the role of the arrogant career politician who leaves the scene of the accident, failing to even report the event to the police. Sadly, a fascinating story that essentially ended the presidential hopes of Kennedy lacks passion and vigour as director John Curran (Tracks, The Painted Veil) allows the narrative to simply plod along. More haunted house hokum as Dr Eric Price (Jason Clarke – Mudbound, Terminator Genisys) is hired to ascertain the sanity of heiress Sarah Winchester (Helen Mirren – The Queen, Red). Seems she is haunted by the spirits of those killed by the Winchester repeating rifle – and making decisions her board of directors are none too keen on. With its pertinent anti-gun message, Winchester is timely in the telling of a story based on actual events as Sarah adds room after room to her already enormous home to house the spirits. And the Spierig Brothers’ (Predestination, Daybreaker) latest certainly looks good, with added gravitas provided by Helen Mirren. But sadly Clarke is not convincing as the laudanum-addicted psychiatrist and the chills are little more than lukewarm. All a little too familiar. I wish I could say that Baltasar Kormakur (101 Reykjavik, Contraband) had created a thrilling, humane spectacle. Sadly, I cannot. It’s the templated disaster movie a.k.a The Towering Inferno and Airport. 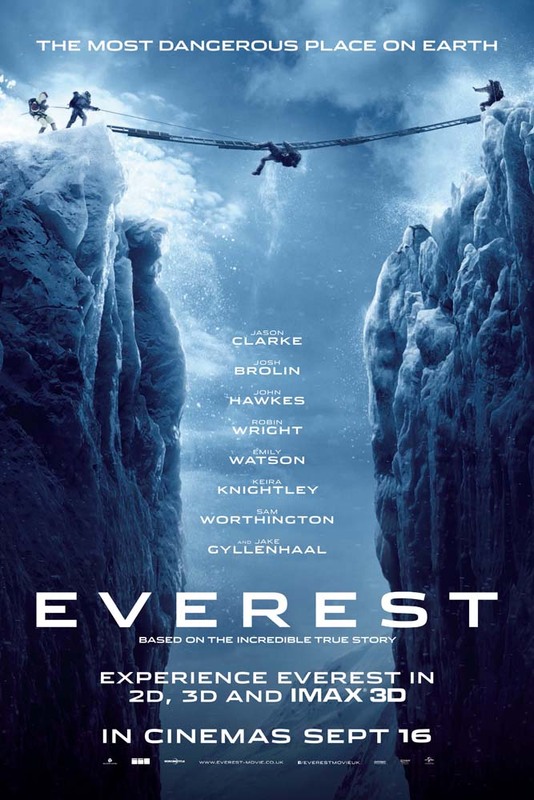 Spend the first half of the film introducing the main players (and it’s quite some cast – Jason Clarke, Jake Gyllenhaal, Josh Brolin, Emily Watson, Keira Knightley et al) followed by the edge-of-the-seat thrills as the group battle the storm to get down from the Everest peak. But like those earlier 1970s features, it just does not work. The characters are so thinly sketched they are only moderately engaging. And by the time disaster hits, it’s somewhat underwhelming and uninvolving. The result is an ultimately dull film.